Samantha is back and looks like the girl is willing herself to give more than 100 per cent to all her films. So much so, that she is now even dubbing her lines for Neethaane En Ponvasantham. This Chennai girl has been in the city for the last couple of days, resuming work in the Gautham Menon film. And a well-informed source tells us that she has already started dubbing her lines. She has been spending most of her time in the dubbing studio, getting her lines right. The source says, "This is the first time that Samantha is dubbing for herself. She has always had Chinmayi giving her voice onscreen. In fact, the singer had even dubbed for her in the trailer, which was released online a few of months back." The Naan Ee girl has always praised the singer, even writing, "Thank you my lucky charm. You do half my job!" While Samantha was unavailable for comment, her spokesperson confirms that she's resumed work on the film and has begun dubbing her own lines a couple of days ago. From the time Nayanthara has made her comeback in the industry, she has been contemplating doing a number of projects. Now it looks like the actress would be returning to her parent industry soon for a film opposite Prithviraj. Nayanthara had voluntarily bid a temporary adieu to films after she had decided to tie the knot with actor-director Prabhu Dheva. But then the wedding never happened and the couple called it quits. The movie Arival Chutika Nakshatram will be directed by Amal Neerad. In this Malayalam film, Mollywood superstar Mammootty will play the male lead and Prithviraj, the villain. Nayanthara has supposedly replaced Vidya Balan, who was the first choice for the female lead. Dhanush has often been compared to the legendary Bruce Lee for the uncanny resemblance in their looks. But the lanky star has said that just his jaw structure is similar to Bruce Lee's. Nevertheless he feels happy to be compared to the legendary martial arts superstar. He also says that he used to feel very offended during the early days of his marriage when suddenly people started looking at him differently due to the fact that he was Superstar's son-in-law. Later he understood how big his father-in-law's shadows are. 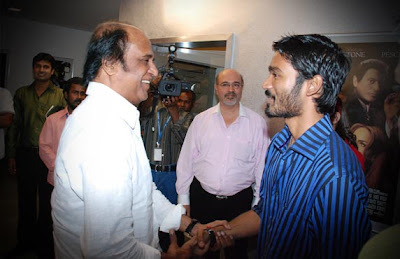 Rajini being an icon and a big phenomenon, Dhanush soon accepted this reality and started working really hard to come out of Rajini's shadows and prove himself as an individual. With Onam just having passed, Asin was busy celebrating the festival in Mumbai in a simple way with her family and friends. She had the customary Onam Sadhya and also made the flower Pookalam with her close friends at home. She also caught up with some of the Onam special programs on TV in the company of her friends and family. Later, she made it a point to send out some of the Onam special food items to her friends in the Bollywood industry like Sonam Kapoor and her Housefull 2 co-star Jacqueline Fernandez.